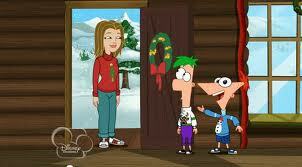 Phineas and Ferb's second Christmas special was quite a bit smaller and less ambitious than their first. I also liked it quite a bit more. This is essentially a half-episode, which is a format the series is used to: most Phineas and Ferb episodes are broken into two unconnected 11 minute shorts. This differs from the norm in that it's a standalone: there's no "second short" following it. My guess is it was produced to be aired along with the much longer special from the prior year (with commercials, they should fill out an hour together). 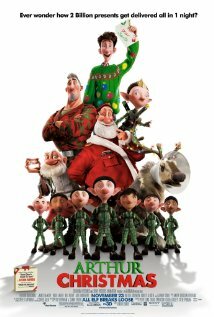 One of last year's best surprises was Arthur Christmas, a brilliant movie which re-imagined the Santa myth and told a nuanced holiday story. Like most big budget production, this one included toy tie-ins. At the time, these were going for around four bucks a pack, so I waited until they were less than a buck. I bought these several months ago, so I wouldn't swear my memory's accurate but I think I paid ninety cents for each of these 2 packs. And, honestly, that might be a bit more than they're worth. I love these characters, but these toys are kind of pitiful. The detail work just isn't here: if anything, these remind me of toys you'd expect to get out of a vending machine. The plastic is cheap and rubbery: Arthur barely stands up straight and requires occasional adjustment. The paint work, while partially hidden by the scale, is still below expectations. There's not a lot of detail here. 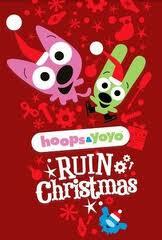 Hoops and Yoyo are a pair of characters created for Hallmark. Personally, I find it disturbing to discover there are no laws on the books preventing greeting card companies from building their own franchises, but that's just me. According to Wikipedia, Hoops is a cat and Yoyo is a rabbit. I was not able to determine this from the special itself, but I can kind of see it now. The special is stylized to look kind of like it was done using paper cutouts, but it's all clearly cheap CG. The plot follows the two title characters, along with a mouse, as they somewhat accidentally stow aboard Santa's sleigh, then fall off while he's flying through a wormhole and get flung back in time. The wind up interfering with a young Kris Kringle and nearly destroying Christmas forever. To date, Lindsay and I have actually only watched four episodes of Community, three of which were about Christmas. To give you a sense of where this is going, we just bought the season one and two DVD sets on the strength of two of the Christmas episodes. The episodes in question are completely different - in fact, each of the three is fundamentally in a different genre - but they're absolutely fantastic, both as Christmas episodes and as comedy. I'm going to look at them starting with the oldest, which is completely different from the order we actually watched them in. First the good news: this wasn't awful. In fact, taken on its own merits, it was even good. It was funny, cute, and kind of fun. But that's just not good enough this time. This isn't a new special existing in a vacuum: it's the sequel to the single best Christmas special made in more than a decade. And this one doesn't measure up. The original, while not being too dark for kids, was exciting. Yeah, half was devoted to heart, but when things turned, there was a real sense of danger. That was completely missing this time around: I never felt like the elves could actually die. There were still some cool scenes, particularly the opening, which expanded the series's mythology by showing the other half of the operation: the elves there to punish the bad kids. For a minute, there was a darkness to the tone, but they just couldn't hold it. Almost immediately, we shifted to the comic relief. And guess who played that role. 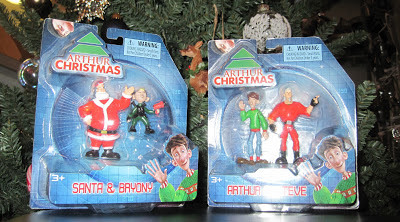 This might change after I see this a few more times, but for the time being I consider Arthur up there with the best Christmas movies ever made. The top three - Nightmare Before Christmas, Elf, and Miracle on 34th Street - are now the top four. 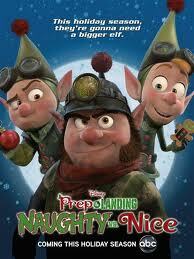 At its core, Arthur Christmas is a brilliant little picture about a dysfunctional family at Christmas time. The reason we should care is that this family is heir to the Santa dynasty, a lineage of Father Christmases going to back to St. Nicholas. There's a lot to like in this one. Right off the back, the portrayal of the operation is ingenious and original. Comparisons to the Star Trek Enterprise are obvious - I'd argue that there are at least as many parallels with Battlestar Galactica. This Santa's using technology a few hundred years ahead of the rest of the world. Intriguingly, they've also got some more traditional magic in reserve, though that's generally become obsolete.